Bulk dentist gift kits, personalized your logo or text. 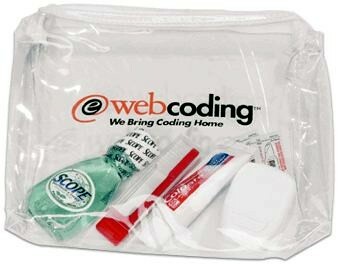 We also supply blank (not imprinted) wholesale dental kits for $5.46 each. Budget Prices in USA and Canada for wholesale personalized dental kits . Free artwork design. US clients pay no taxes, Canadian clients don't pay PST. We will send you a proof for your approval before production. Unit prices below include your 1-color custom imprint. Additional imprint color or position: add $0.30 per dental kit. The dental kit includes a custom imprinted bag with a travel toothbrush in assorted colors (toothbrush will vary from kit to kit), a tube of Colgate toothpaste, dental floss, Scope mouthwash and 2 Blistex packets. Size: 8" W x 5" H x 2" D.
Additional Colors/Positions: Add $0.30 each. Tight Registration imprints are subject to review and approval by factory. Color: Clear, Translucent Blue, Translucent Green or Translucent Red with White Zipper. Imprint Area: 5 1/4" W x 3 1/4" H.
Packaging: Individually polybagged; 50 pieces per carton of 22 lbs.